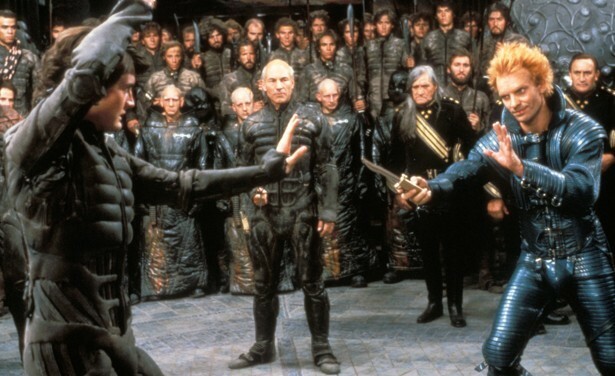 In our continuing series of 47 films to see before you are murdered in your dreams we present Dune. Blue Velvet disturbs and Elephant Man moves, but David Lynch’s Dune is by far his most entertaining film. Based on Frank Herbert’s epic novel, it tells the tale of House Atreides and their move to the desert planet of Arrakis, the only source of the hallucinogenic Spice. Don’t worry. This isn’t about turmeric or something. The Spice allows for the navigators to fold time and space and thus travel vast distances through space. Paul Atreides – the Duke’s son – is being trained by his weird mom as well as Jean Luc Picard to take over from his father. The dangers of complicated politics and particularly the threat of the rival Harkonnen house, a family that resembles a less fat and disgusting version of Donald Trump, surround the family and soon mother and son are fleeing into the desert as the family are attacked. Here as the Harkonnen take over the planet, Paul and his magic mum seek refuge with the Freemen. Sorry, I meant Fremen. Of course, the film has flaws. I can’t think of any, but it has them. Perhaps the last half becomes lost as it does its best to take us through the messianic rise of Paul. But frankly the flaws are also in Herbert’s novel. Like Lord of the Rings, Dune is basically an okay-ish novel, full of mock medieval scrumptons and elevated by the worlds invented around it. Lynch’s vision is startling and has moments of genuine beauty and ugliness. The cast are superb. The guy from Das Boot, Picard, MacLachlan and Sean Young are great. And then there’s Sting in his pants! Sting. In. His. Pants.